Is it your aim to post these signs in all of the cabins at Fish in a Barrel pond? Is the fishin’ in the pond so poor that the fishermen seek alternatives? I can see your mind needs occupyin’. The sugarin’ ‘ll be startin’ before you know it up on Bobo’s Mountain. Hang in there! Fishermen will do all sorts of things and, yes, these signs will be posted although at first we thought the reference was to peeing on the wall. Reservation day is tomorrow so my mind is plenty occupied at the moment; a few days tapping trees will be a pleasant diversion. The fact that such a sign is required says something about the piscatorial arts in other countries. I am always amazed at the sorts of signs that become necessary. This is may be an example of a couple of people getting carried away and ruining the fun for everyone else. 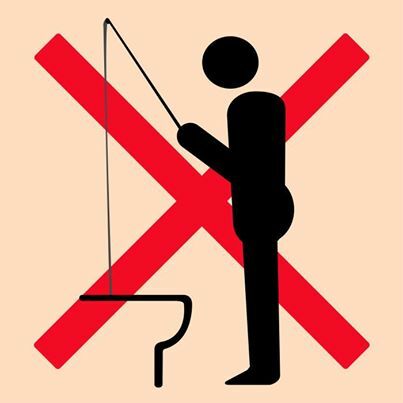 Sometimes it’s just easier to ban toilet fishing outright than to argue about it. Is that a fishing rod he’s holding? It looks Tenkara to me. In an effort to retain this blog’s standing among members of the Tenkara community, a helpful friend has tweeted this post with the hash tag #Tenkara. Thank you, helpful friend! I love picture signs. I remember in the days when everything was O.D.and we were the Ma Bell for the U.S. Army. All our communication vans had a sign stuck to the interior wall picturing a human form bent slightly forward and emitting a cloud of gas from the rear with a red diagonal line running thru it.